Usually my posts are triggered by a fleeting thought, experience or something that was said. 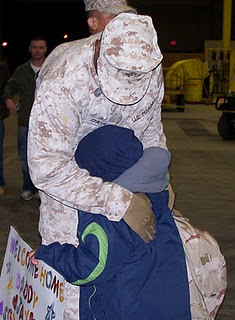 Today it was this photo of my husband returning home from Iraq. My son and I had made the poster a week earlier, but I had not told him daddy was coming home until we were leaving to go pick him up. This photo is a reminder of what a blessing it is to have a complete family and to never take them for granted. My daydreams and prayers are often interlaced with thoughts of The Dudley Family; whose family is now incomplete. Marine Corps Staff Sergeant Dudley was killed in action back in July. This fallen hero wasn’t the first, he wasn’t the last, and though he is one of many, his story has affected me the most. It’s not so much his story, rather his wife’s account of what Three Knocks on the Door meant to her when she immediately knew her husband wasn’t returning home to her and their three children. If you click back a year in Mary Dudley’s blog, you’ll find one titled, I love my little family. It is hard to treasure each day as if were your last one with your loved ones. We may not even like them on any given day. We love them, but we are busy, we are tired, and we have stuff to do. Life happens, but don’t be too busy for small love offerings – a kiss goodbye, a hello call during the day, and a hug when returning home. What if it were the last one? I shudder at the thought. I have been thinking about starting an old fashioned, handwritten gratitude/success journal. Well, probably not old fashioned or handwritten, if I can find an app for that. But I want to focus on being positive and appreciating each day – “to unlock the fullness in life”. There is something to be thankful for each day and as for successes – well, I’m working on that. Here’s the thing…Today I will record that I am grateful for a complete family and today's success is that they both ate the “What’s this?” chicken. Two and a Half WIN!